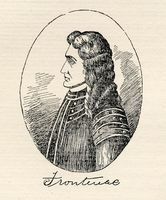 DUFROST DE LA JEMERAIS, CHRISTOPHE, nephew of Pierre Gaultier* de La Vérendrye and his “second in command” in the venture to discover the “Western Sea”; b. 6 Dec. 1708 at Varennes, last child of François-Christophe Dufrost de La Gemerais and Marie-Renée Gaultier de Varennes; d. 10 May 1736 at Fort Maurepas, a bachelor. Christophe, the youngest of the family, entered the army very young. He served at Fort Saint-Philippe des Miamis from 1723 to 1725; he was appointed a cadet in 1726 and continued to serve at Saint-Philippe until 1727 when he went to Fort Beauharnois des Sioux, built by René Boucher* de La Perrière in that year. 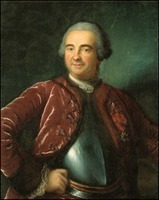 In 1728 Boucher de La Perrière had to leave the fort, and La Jemerais remained temporarily in charge of the post during the winter. Towards the end of the season, young Dufrost, accompanied by a few soldiers and a group of Indians, including several Fox chiefs, went to the St Joseph River to see the commandant of the fort, and continued on to Montreal, leaving Fort Beauharnois without a garrison. He carried out this mission at the request of the Indians, who had several misdeeds to be pardoned for. On the way these Indians, afraid of the presence of their enemies, particularly of the Ottawas, abandoned the party; La Jemerais had to go on with his soldiers, and reached Montreal on 31 Aug. 1729. In 1731 he went with his uncle La Vérendrye on his first expedition towards the western sea; it led first to the construction of Fort Saint-Pierre, at the western extremity of Lac La Pluie (Rainy Lake). The following year he accompanied the explorer to Lac des Bois (Lake of the Woods) and helped him to build Fort Saint-Charles there. In the spring of 1733 he went to within a few leagues of Lac Ouinipigon (Lake Winnipeg), together with his cousin Jean-Baptiste Gaultier de La Vérendrye, in search of a suitable site for the building of a fort. Then he made his way eastwards, in order to inform the governor of the new discoveries. Returning to the west in 1734, he replaced his uncle at Fort Saint-Charles; on 9 March 1734, as a result of a request of Madame de Vaudreuil [Joybert], he was appointed second ensign. La Jemerais wrote to the governor on 23 July 1735 to inform him of the commercial activities of the posts. He was instructed to visit the Mandans in the Missouri region, and the following year was sent to Fort Maurepas on the Rivière Rouge, where, during the winter, he fell seriously ill. He died on 10 May 1736, while his two La Vérendrye cousins, who had been sent to his aid, were trying to bring him back to Fort Saint-Charles, using a route that no other Frenchman was to follow before the conquest of Canada. He was buried “at the Fourche des Roseaux,” near the present village of Letellier in Manitoba. La Jemerais had a fairly good education, was familiar with cartography, and knew how to “measure an elevation.” He has left us the first French map of the west, which is also the best. It is dated 1 Oct. 1733, and the final drawing is by the engineer Gaspard-Joseph Chaussegros* de Léry. The father of Christophe, François-Christophe was a descendant of the old noble family of the Dufrosts, which according to authentic documents goes back to 1409. François-Christophe was the son of Christophe Dufrost, Sieur de Boissemances, and of Marguerite de La Forest, Dame de La Gemerais; the latter belonged like her husband to the nobility of Brittany, and she transmitted her last title to her new family. François-Christophe obtained a post as mid-shipman in 1683, and two years later he came to Canada with Brisay de Denonville. 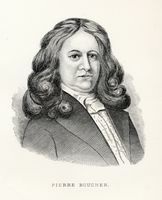 On 17 March 1687 he was appointed an ensign and served at Fort Niagara (1687–88). In his report of 1689 Louis de Buade* de Frontenac had nothing but praise for François-Christophe, and in 1692 gave him a commission as lieutenant, which was confirmed by the court on 1 March 1693. On 5 May 1695 he became a sub-lieutenant, and on 15 June 1705 was appointed captain. In the meantime he served a few years (1696–99) at Fort Frontenac (Cataracoui; now Kingston, Ontario). He died on 1 June 1708 at Montreal. On 18 Jan. 1701, at Varennes, François-Christophe Dufrost had married Marie-Renée Gaultier de Varennes, daughter of René Gaultier* de Varennes and Marie Boucher and granddaughter of Pierre Boucher. They had three sons and three daughters, all born at Varennes; one, Marie-Marguerite*, was to become the foundress of the Sisters of Charity of the Hôpital Général in Montreal. AE, Mém. et doc., Amérique, 8, ff.46, 69. AJM, Greffe d’Antoine Adhémar, 10 janv. 1701; Greffe de J.-B. Adhémar, 6 mai 1731; Greffe de Jacques David, 27 mai, 1726; Greffe de C.-J. Porlier, 22 mai 1734; Greffe de J.-C. Raimbault, 2 juillet, 21 août 1732; Registres des congés, 1721–1726. AJQ, Greffe de J.-B. Peuvret Demesnu, 12 déc. 1712. AN, Col., C11A II, ff.28f. ; 51, ff.131, 135f. ; C11E, 16, f.134; D2C, 47, ff.49–62; E, 263; F3, 2, ff.489–91; 12, ff.85–87. Service hydrographique de la Marine (Paris), Dépôt des cartes et plans de la Marine, 4044B, 39, 85. Decouvertes et établissements des Français (Margry), VI. [La Vérendrye], Journals and letters of La Vérendrye (Burpee). “Lettres du père Aulneau,” APQ Rapport, 1926–27, 290. Wis. State Hist. Soc. Coll., XVII. L. J. Burpee, The search for the western sea (London, 1908; rev. ed., Toronto, 1935). Parkman, A half-century of conflict. L.-A. Prud’homme, “Documents sur la découverte du Nord-Ouest,” Société hist. de Saint-Boniface Bull., I (1911). Antoine Champagne, “DUFROST DE LA JEMERAIS, CHRISTOPHE,” in Dictionary of Canadian Biography, vol. 2, University of Toronto/Université Laval, 2003–, accessed April 22, 2019, http://www.biographi.ca/en/bio/dufrost_de_la_jemerais_christophe_2E.html.